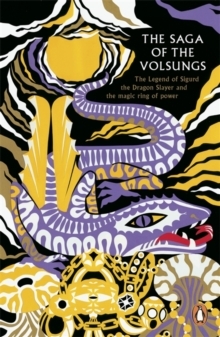 Part of a new series Legends from the Ancient North, The Saga of the Volsungs is one of the classic books that influenced JRR Tolkien's The Hobbit and The Lord of the Rings'They summoned their friends, readiedtheir horses, and prepared their helmets,shields, swords, coats of mail' J.R.R. Tolkien spent much of his life studying, translating and teaching the great epic stories of northern Europe, filled with heroes, dragons, trolls, dwarves and magic. He was hugely influential for his advocacy of Beowulf as a great work of literature and, even if he had never written The Hobbit and The Lord of the Rings, would be recognised today as a significant figure in the rediscovery of these extraordinary tales. Legends from the Ancient North brings together from Penguin Classics five of the key works behind Tolkien's fiction.They are startling, brutal, strange pieces of writing, with an elemental power brilliantly preserved in these translations.They plunge the reader into a world of treachery, quests, chivalry, trials of strength.They are the most ancient narratives that exist from northern Europe and bring us as near as we will ever get to the origins of the magical landscape of Middle-earth (Midgard) which Tolkien remade in the 20th century.